’Tis the season for paring down and reevaluating the pieces we’ve accumulated throughout the past year. With spring-cleaning just around the corner, getting a head start can help take the sting out of the massive cleanup effort in store for us come March. Read on for the design-forward, minimalist alternatives to bathroom essentials that will give your space the refresh it deserves. Simplicity is at the core of HAY’s design philosophy and naturally, it trickles down to every piece—toothbrushes included. Available in a variety of colors, this sleek rendition of the staple will bring a pop of color to your vanity. No detail goes unnoticed in a minimalist scheme, and that certainly extends to soap as well. Pair this no-frills, transparent version with an equally streamlined concrete or marble soap dish. Limit the amount of clutter on your vanity by corralling your decorative accessories within a sleek tray. This lustrous version, and its reflective finish, is ideal for small spaces. Muji’s take on a toothbrush holder is the personification of minimalism. Simply prop your brush in these colorful stands and relish in the ample sink space you have leftover. Gather your random odds and ends in these sleek vessels, ideal for containing hair ties, bobby pins, and various other miscellaneous trinkets. The opaque finish further helps conceal the contents inside. Bonus points for mixing and matching the multitude of available colors. In a small space, every square inch counts, and round, bulky trash cans need not apply. Swap in this sleek number instead—it’s much more conducive to fitting in the tiny nooks and crannies of your bath. If you’re looking to bring in added storage, consider an option that comes with multiple points of functionality. This wall-mounted mirror, with its cleverly concealed shelving unit, will help keep clutter at bay and effectively out of sight. 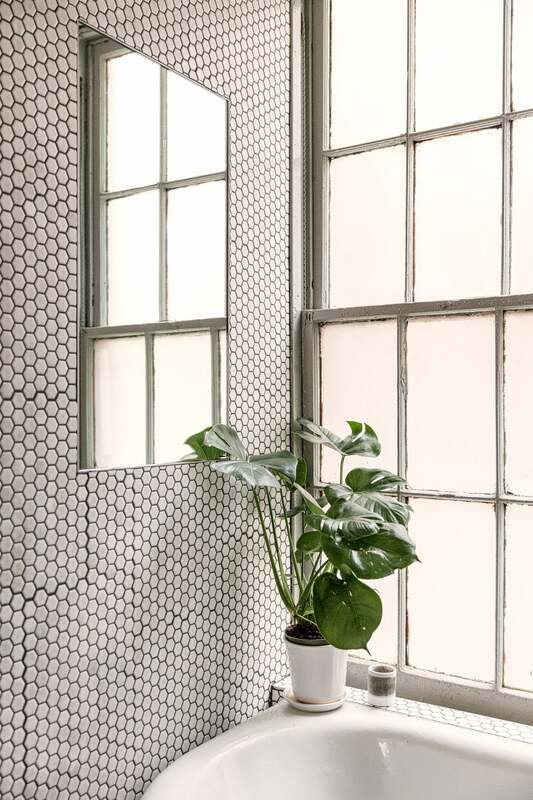 A vibrantly patterned shower curtain has the potential of evoking an overly busy feel, especially when it comes to bathrooms loaded with gear. Consider a transparent liner if, you’re in a really small space or a minimally patterned version such as this delicately detailed one. Lining the perimeter of your tub with shampoo bottles and various other accessories is not a good look—not to mention a nightmare to clean around. Designate a specific storage solution, such as a sleek shower caddy, to keep things tidy and in one place.